"Your Invited ! Craft Coach is hosting a 3 day event with Melissa Frances in September! Guests will complete 3 projects designed and instructed by Melissa. Learn book binding and more! Choose the VIP option and stay at Whitworth Ranch Retreat and have dinner with Melissa and get a bonus project!" VIP - all projects and Stay at Whitworth Ranch Retreat Thurs-Sunday. includes meals - $850.00 - $600.00. For more information, visit their website or contact their event coordinator, Billie, at craftcoachshop@gmail.com / billmlong@live.com / 817-733-2593. Booths are 10 X 8 and cost $60. Applications are available here and are due by October 15th, 2013. For more information, view their Vendor Info here and here, or contact their event coordinator at kimkrie@aol.com / 214-463-5101. Booths are 10 X 10 and cost $65. Electricity, table and lunch available for purchase. For more information, visit their website or contact their event coordinator, Julie Haynes, at guyerchoircraftshow@gmail.com / 940-725-0022. This fee includes event t-shirt, your linked logo on the Funky Finds Holiday Shopping Experience 2013 website for one year, listing on promotional items, 10% on booklet advertising, opportunity to have a listing on the back of Event & Vendor T-Shirts, opportunity to donate promotional items to 150 swag bags, and event promo postcards to distribute. Tables and chairs are available for rental. Applications are available here and are due by August 12th, 2013. For more information, visit their website or contact their event coordinator at info@funkyfinds.com / 903-665-7954. "The United Methodist Women of First United Methodist Church, The Colony, Texas, will host its 25th Annual Harvest Craft Bazaar, Saturday, October 5, 2013, from 9:00am to 4:00pm. Retail and handmade craft vendors show case their goods including crochet and knitted items, holiday decorations, wood art, jewelry, stained glass and much more. Bounce house, children's activities and food!" Booths are 10X10 and cost $45. Only outside booths are still available. You may bring a canopy. Tables rented for $10 each, bring their own chairs. For more information, contact their event coordinator at pat.ellis@bobnpat.net. "The Sip 'n Shop Artisan Showcase is for the residents of One Montgomery Plaza, a luxury high-rise condominium community on West 7th in Fort Worth. 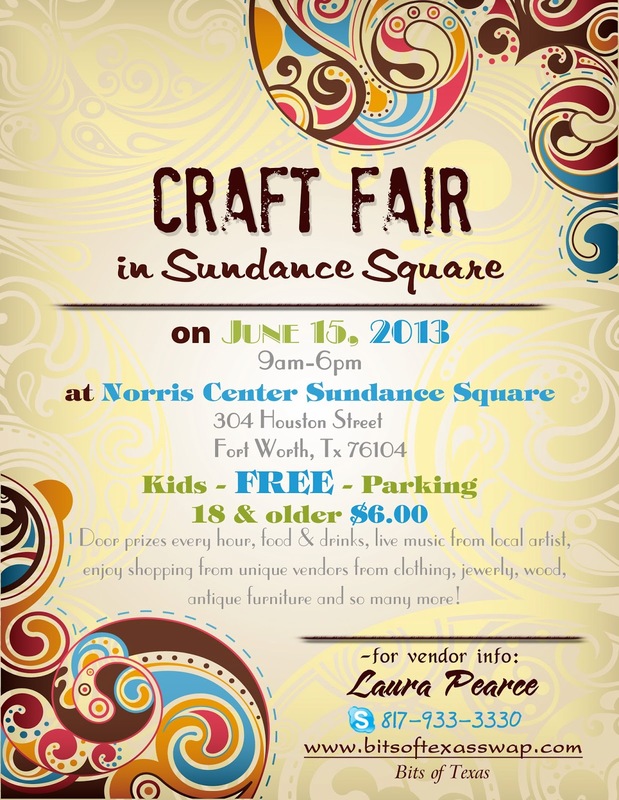 Grab a glass of wine and shop a select group of artisans showcasing their wares. Vendors range from jewelry to photography to hand-crafted food goods." Booths are your own table and there is no fee to participate. However, you must bring a bottle of wine to serve to the shoppers. OMP will provide plastic cups and light appetizers. Electricity is free but you must provide your own extension cords. You must provide your own table, chairs, linen, etc. However, there are two bars in the common area that can be utilized as part of your display. First come, first served. Applications are available here and are due by June 25th, 2013. For more information, visit their website or contact their event coordinator, Ellen, at craftfest@summitband.com / 817-487-2786. Booths are 10 X 10 and cost $75. Students will be helping vendors with unloading. Electricity will be available but will be a limited number of spots. If vendors stay until the end of the Show they will receive a $5.00 refund. For more information, visit their website or contact their event coordinator at b.williams2015@yahoo.com / 214*542*4795. Booths are a 6X8 space and will be $55.00. Tables are available for $15.00 and electrical hookup is $10.00. Tables and Electrical spaces are limited and will be available first come first serve. 2 Chairs will be provided for each booth. Applications are available here and are due by September 13th, 2013 ASAP. For more information, contact their event coordinator at amamommerrymultiples@gmail.com. Please refer to the Layout here. Applications are available here and are due by June 17th. Please review their Vendor Info and Rules and Cover Letter for more information. For more information, visit their website or contact their event coordinator at VendorCoordinator@starttheseason.com or pam.farrington@tx.rr.com. "Door prizes every hour, live bands, vendor give-aways, food/drink concessions, face painters, balloon artist, over 150 vendors to shop from!" Admission Fee is $6.00 for 18 years and older. "Possum Palooza - Classic Car Show/ Vintage Tractors/Car-Art/Junkrods! Raffles/Silent Auction/5K Possum Trot! LIVE MUSIC 11am-12midnight! 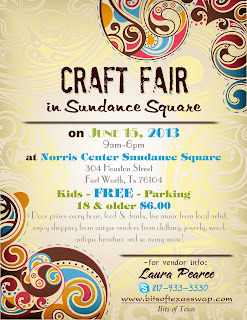 Arts & Craft Vendors/ Food Vendors/ Artisians!" Festival and Live Music Outside is free! Possum Palace (indoor) concert hall - $5.00.